In the era of mill made fabrics and synthetics dominating the fashion market, there are those who still have immense love for weave fabrics in their hearts. Weaving art has been prominently appreciated and is in demand in many foreign countries. 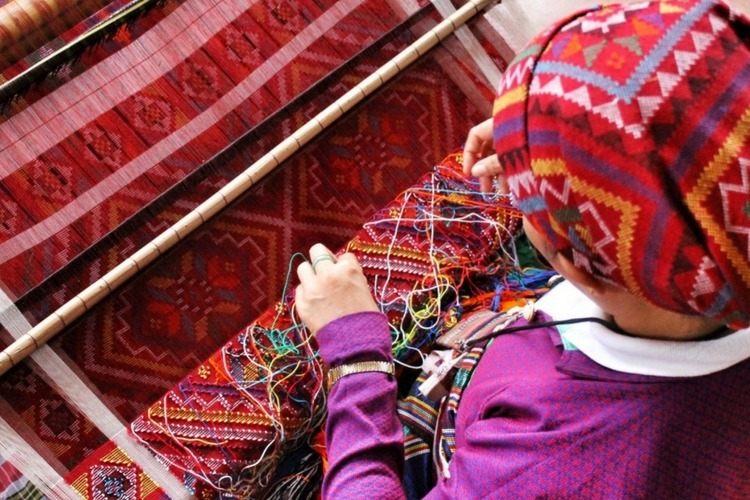 Weaving art is typically known as fabric that is made out of hands and not by machine. It is a very time consuming process and needs lot of creativity and efforts by the artisans. Plain Weaves – This is the simplest and most common type of weaving. The fabric is made by one weft yarn going over and under another yarn. Some examples of plain weave fabrics are crepe, taffeta, organdy and muslin. Basket Weaves – Basket weaves are checkerboard patterns contrasting two colors. Basket weaves are less expensive but also less durable compared to plain weaves. Two or more yarns are lifted or lowered or under same number of yarns. Twill Weaves – The fabric possesses diagonal ridges formed by the yarns that are exposed on the surface. Corkscrew, chevron and diagonal type of designs that can be created by Twill Weaves. India is the only country that still produces handmade fabric. Weaving art is one of a kind, but is highly undervalued and under-appreciated by majority of the population. But there are few upcoming fashion brands that are taking initiative to save this art & bring it back into fashion. So it is safe to say that this art of weaving is here to stay for a long time and will accomplish the esteem that it deserves.